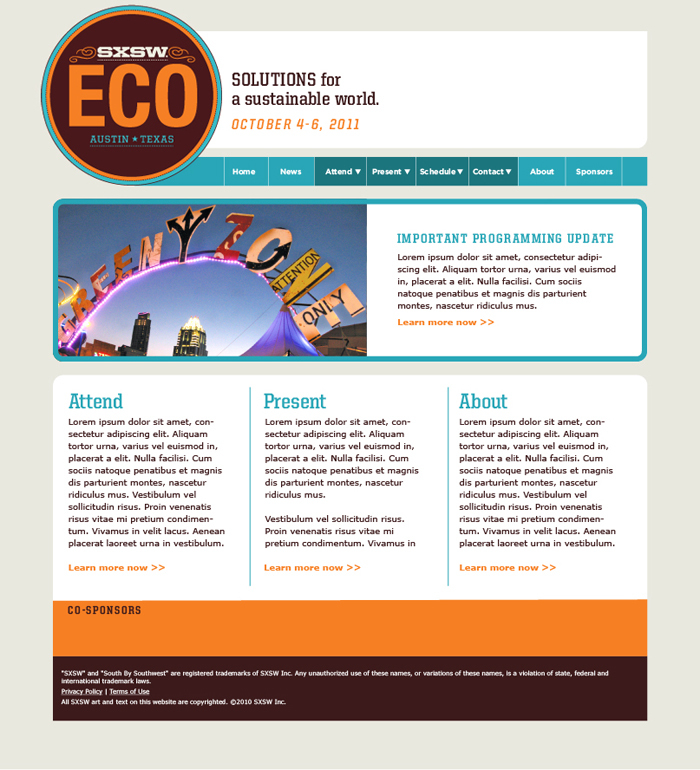 SXSW Eco was the first new conference created by SXSW in 18 years and it was my job to create its visual identity. Its focus on “presenting experts in the public, private and academic sectors committed to finding solutions for a sustainable world” is a fairly crowded field in the conference space, so the challenge was how to make SXSW Eco stand apart from the field at first glance. Through research I discovered how the graphic identities of our competitors were all somewhat similar to one another. Green (as a color) was an overwhelming theme, along with blue and swirling motions. I decided to create a look that reflected the four most discussed elements of the environment (sun, wind, water and earth), using a more contemporary color scheme. For the logo I leveraged the parent brand, as this association was important for recognition, and used concentric circles of color to subtly show a relationship between the elements and the earth.